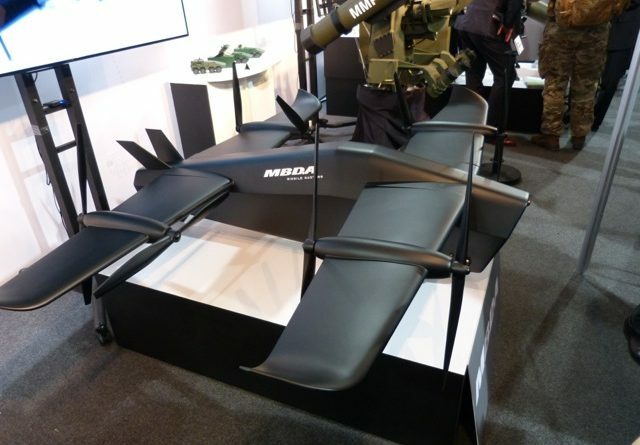 At DVD 2018 at the Millbrook Proving Ground, MBDA unveiled a company- funded low cost tilt-rotor armed unmanned aerial vehicle (UAV), SPECTRE. Designed to be an on call organic capability for ground forces, it provides rapid close air support at sub-unit level in military organisations. 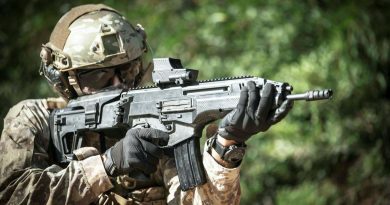 It is intended to navigate, find, fix and track targets with an operator over the loop (OOTL) with firing authority always remaining with the human operator. SPECTRE is an electric-powered vertical take-off and landing (eVTOL) aisystem capable of quickly transitioning to forward flight mode for rapid low-level traversal of complex terrain. The 2-metre wingspan SPECTRA has a 25 Kg payload and is optimised to around MBDA’s low-cost lightweight, high precision ENFORCER missile to defeat challenging targets in complex contexts. Its flexible capability enables it to carry a variety of mission modules that can address a broad range of ground targets from asymmetric threats to armoured targets, suppression of enemy air defenses (SEAD) be an electronic warfare (EW) platform and could be equipped with the countermeasures system such as the BriteCloud small active self-contained digital RF memory (DRFM) countermeasure. 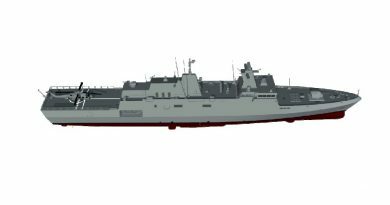 With its payload capacity and 10 km combat range, it could undertake remote resupply to the front line. With SPECTRE’s robust anti-jam navigation and intelligent guidance to navigate complex terrain at low-level it is a capability suitable to support land, maritime, and air forces, as well as special operations. With increased dispersed operations demanding greater tempo and mobility, SPECTRE multiplies the reach, responsiveness and arcs of fire provided by ground forces. It will be able to find and fix threats to ground forces beyond- line-of-sight (BLOS) in complex environments, supporting recce efforts, counter massed future unmanned ground threat without placing personnel at risk and cover dead ground quickly in friendly operation areas to ensure their protection. SPECTRE will be scalable to enable co-operative swarming.